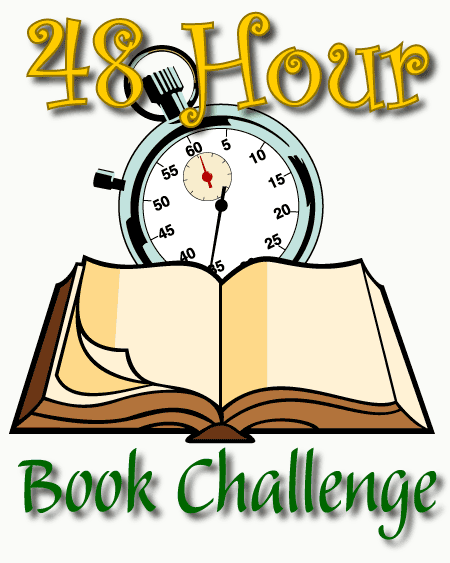 While catching up on One Literature Nut's blog post about the end of the year and her goals for the summer, I decided to join her in the Fifth Annual 48 Hour Book Challenge. The Fifth Annual 48 Hour Book Challenge is being organized by Mother Reader at The Heart of a Mother. The Soul of a Reader. From June 4 (Friday) at 7 am to June 7 (Monday) at 7 am. Choose your own 48 hour period within those days and times. The 48 hours should be consecutive. You need to do at least 12 hours straight to qualify for any of the prizes. Track your time carefully (no cheating by rounding up!) because the prizes will be based on time logged and not the number of books completed. The top 3 participants win a special mention and prizes. Books should be about fifth-grade level and up. Adult books are fine. Graphic novels can be included in the reading. One audiobook can also be included in your time and book total. Writing time counts too. There's no specific requirement or guideline as to the length of review or type of notes that you post. A sentence, paragraph, or a full length review are all welcome. The time that you spend reviewing is counted towards your total time. Keep track! Time spent reading other participant’s blogs, commenting on participating blogs, Facebook pages, Tweeting about your progress counts too (Don't forget to use the #48hbc tag!) For every five hours, you can add one hour of networking. Count this in your total time. If you decide to join, know the specific date and time that you intend to begin. Comment here and let me know that you're in. I'll cheer you on as I go about the challenge! On the first day of your challenge, write a post about the challenge, your goals, etc. and then leave the link to that post (via Mr. Linky) at the Starting Line post at MotherReader. MotherReader's Starting Line post will be up on June 4. Do keep a meticulous log. Your final summary must be posted by noon on Monday, June 7. Then submit the link to your post to the Finish Line on MotherReader. Mother Reader will put up the Finish Line on Sunday. 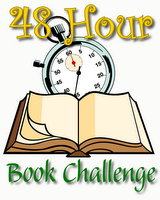 Last year the organizers linked the 48 Hour Book Challenge with charitable causes. MotherReader suggests supporting book and literacy causes and has recommended using Donors Choice, an organization that links teachers in need of supplies with donors, to help find a cause. She's selected a school in DC and will donate $1 per hour to the school. I've been thinking of sending books to a school library in the Philippines. Throughout the year that I've been blogging, I've been setting aside books that I'd like to ship back to the Philippines. Postage is expensive, close to $70 per box, so I'm being very selective. I'm just sending books that I loved, books that I know will draw a child to reading, books that they'll want to share with friends. You know those books that as soon as you finish them you want to hand them over to someone else who will appreciate the book for the gift that it is? Remember how you felt the first time you read A Wrinkle In Time or White Fang or The Island of the Blue Dolphins or The Hobbit or Catch-22 or Slaughterhouse V? Or The Importance of Being Earnest or I, Claudius? Each one of those made such an impact on me. The Philippines is a country of very limited resources and our government can't afford to spend on public libraries. Even those that sell books for a living, can't survive on the sale of books. Our largest and most profitable bookstore is a combination of Staples and Barnes and Noble and I remember reading that their real profit comes from the sale of school supplies. While things have improved since I was growing up and booksellers do a good job of getting relatively new books to the country and now offer a range of books, they're still relatively expensive and not as varied as what you'd find in your neighborhood bookstore or library in the US. When I was growing up, books were even more limited. We'd read books that we bought ourselves or that we'd borrowed from family and friends (many a friendship was soured by irresponsible borrowing), our school libraries, and the few private libraries in Metro Manila. My mother would return with a huge box of books each time she visited the United States -- she would buy several years worth of reading for the three of us. I spent most of my allowance on books, much the same way that my nieces and nephews do now. The British Government funded The British Council, a wonderful lending library in a gorgeous and well maintained turn of the century house. For a small fee, it was possible to join the British Council and borrow all sorts of British literature and nonfiction books. I didn't learn to drive until I finished college and the first route that I mastered was from my parents' house to the British Council and back. The British Council has since sold most of their fiction holdings and has relocated to a modern building and has limited its selection to nonfiction and more business related books. I remember also being able to borrow childrens' books from a lending library on Camp John Hay, a rest and recreation base in Baguio City that was managed by the United States Air Force at a time when the US maintained military bases in the Philippines. Camp John Hay and Baguio City are in the Northern part of the Philippines, high in the mountains and about a 12 hour drive from Manila. Baguio had always been a popular vacation spot because its higher altitude. Baguio City was one of the planned cities, designed by the Daniel Burnham while the Philippines was under U.S. colonial rule. This is my long way of saying that I'm also grateful to the United States Air Force for making the childrens' library available to Americans and non-military personnel. It was such an unexpected treat! My brothers, cousins, and I would spend summers in Baguio. My cousins would rush to play softball, roller skate, miniature golf, and bowl. But my favorite place was the Camp John Hay library where I found and read Ramona the Pest, and all the Beverly Cleary and Roald Dahl that I could find. At that time, local bookstores didn't carry these books. My mother would take me and my brother to the John Hay library almost every day. Even today, your average reader in the Philippines won't have access to much of the wonderful books that we have here. I've been setting aside books to send to that I think would be wonderful additions to my old all girl's school for the middle school and high school library. My first box of books will be to my all girls' school, Maryknoll (now "Miriam College" but it goes from preschool to college). I'd love to send books to my brothers' schools or the Philippine Science High School. Or to a library of a public school. It isn't hard to come up with the books -- I've noticed that people even leave books on the street here in my Brooklyn neighborhood. It's just coming up with a way to pay for shipping. What books made an impact on you when you were younger? Do you have any books to recommend -- for me to read or to send to the elementary school or high school or college in the Philippines? Please comment below -- suggestions most welcome!! I'm off to rest, plan which books to read, and gather my thoughts on BEA, the Book Blogger Convention and the publishing house tours. Do you think you'll join the 48 Hour Book Challenge? Wonderful pet project! Good luck! You're really awesome, and I'm so glad you're joining in. Since I just joined a few days ago, I hadn't even thought about or considered arranging to do this for a cause. Sad, but true. I just decided to make R&R, with an excuse, my cause. You're really good to put a face to what we're doing!